My Royal Enfield and my distinguished self pose together at the railway station. My Distinguished Gentleman's Ride Saturday introduced me a distinguished gentleman indeed: the fellow who helped me get my Royal Enfield running so I could get home. David McParland spotted me kicking repeatedly with no results and pulled over in his car. Once we'd confirmed the Enfield had gas and compression in the cylinder it was just a matter of figuring out where the electricity had gone off to. I'm a dunce about electricity but David had a meter and the know-how to determine that the battery wasn't up to snuff. He rigged up cables from his car battery and we got the motorcycle running. It was then a simple matter of riding home non-stop. Being helped like this really renews one's faith in the human race. 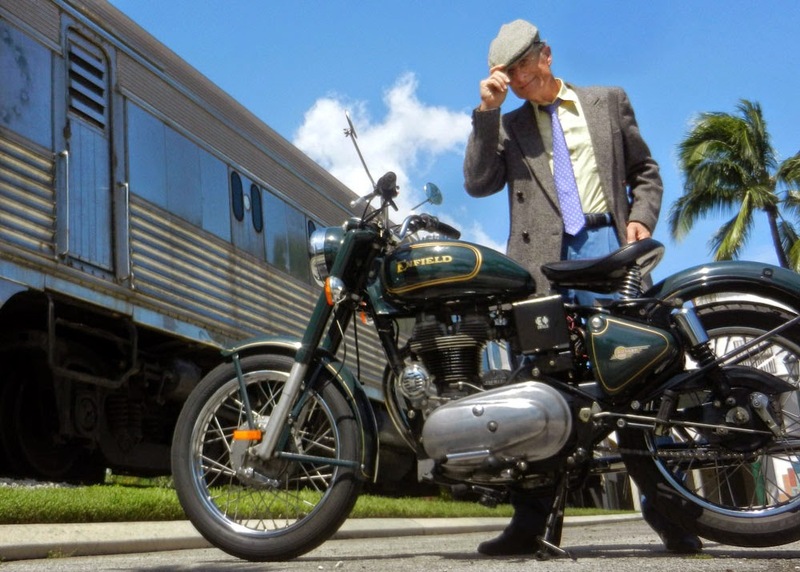 I'd ridden to the Boca Raton Train Museum to get a shot of myself in my dapper duds. I posed alongside the historic rail cars parked next to once was the Boca Raton, Fla. station of the Florida East Coast Railway. Yes, I rode alone. But I did donate to three other rides, so I felt I deserved to get a picture of myself out of the deal. September in South Florida is really too warm and humid for a tweed jacket and a tie. Consequently I was bathed in sweat even before the Enfield decided it didn't want to take me home. I'd have been a lot sweatier still if David hadn't come along when I needed him. Even as it was, he got grease on his hands and nothing but my thanks for his trouble. wow great idea!! Royal Enfield running so I could get home.